Three hand colored lithographic reproductions by David Roberts; two are framed as a pair. 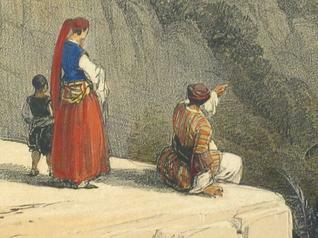 Our prints are all from an 1839 David Roberts trip, and are entitled "The Pool of Bethesda," "Convent of the Terra Santa,"and "Coast of Syria." The two prints in matching frame are in excellent condition; the third print is in very good condition, with some light spotting. The third print is differently framed. We are not print experts, and we suggest you ask us for a a set of high resolution photographs to confirm condition. Despite the different framing, our group of Roberts prints have been owned by one family for more than 60 years. The group was a wedding present to the current owner in 1951 from prominent Chicago businessman and print collector of the mid-20th century, Clarence Edward Estes. David Roberts, RA (October 24, 1796 - November 25 1864) was a Scottish painter. He is especially known for a prolific series of highly detailed prints of Egypt and the Near East. Roberts produced these during the 1840's from sketches he made during long tours of the region from 1838 - 1840. This work, and his large oil paintings of similar subjects, made him a foremost Orientalist painter. He was elected to the Royal Academy in 1841. Robert's extraordinary representation of the sites of the Near East was an immediate and outstanding success upon its publication. Never before had the ancient sites of Baalbec, Petra, Egypt and the Holy Land been portrayed with such splendor or on such a scale. Robert's meticulous draftsmanship and Louis Haghe's skillful and delicate lithography make the work "the apotheosis of the tinted lithograph." When Roberts returned to England in July, 1939, he brought back with him 272 sketches from his journey. Roberts redrew these throughout the following decade for the great group of lithographic series he created of The Holy Land, Syria, Idumea, Egypt and Nubia. The lithographs were published in monthly parts between 1842 and 1849. The first two volumes covered the Holy Land and a further three volumes were released in 1846, 1849, and again in 1849 with the simplified title "Egypt and Nubia." Our group of prints is from the folio editions, full sized.